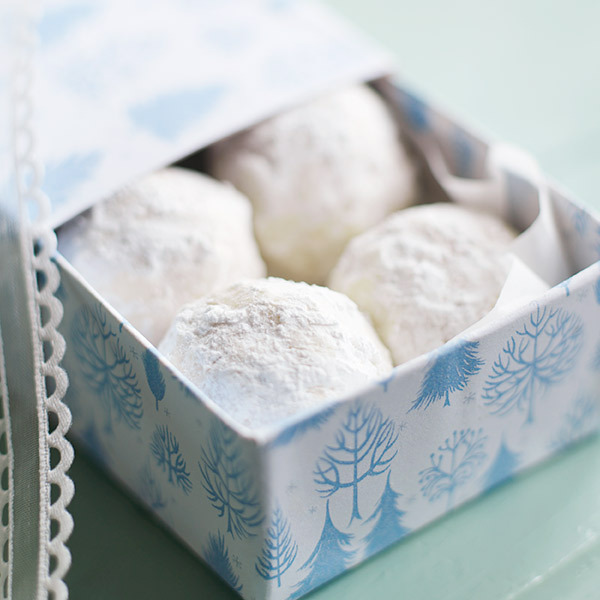 These Russian Tea Cookies are definitely worth the risk of a powdered sugar mustache! Creating these scrumptious snowballs is deceivingly simple. In Hallmark's Russian Tea Cookie recipe, you mix just a few ingredients—butter, flour, confectioners' sugar, salt, vanilla extract and pecans—and dredge the little balls of dough in powdered goodness. Yum! In a large bowl, with an electric mixer, beat the butter and the confectioners’ sugar until creamy. Beat in the vanilla. Gradually add the flour and salt, and beat until combined. Stir in the pecans. Cover and refrigerate for at least 1 hour or overnight. Preheat the oven to 350°F. Shape the dough into 1-inch balls and place on an ungreased baking sheet. Bake for 12 to 14 minutes, until nicely browned. Transfer to wire racks to cool. Dredge the cooled cookies in confectioners’ sugar.